The Patrick AFB Education and Training Center is commited to serving the 45th Space Wing community and to help meet the educational and vocational needs of our civilians and active duty military personnel and their adult family members. 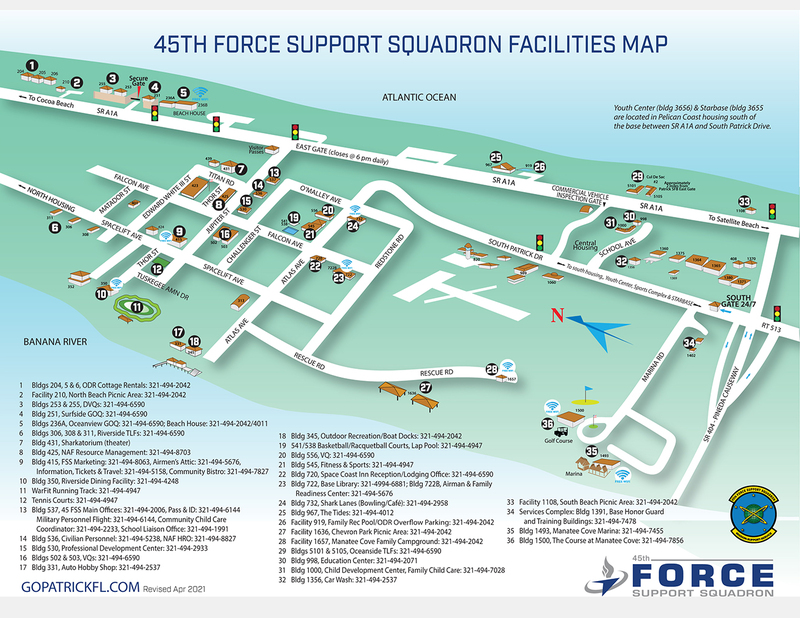 45FSS/FSDE: 1020 Central Ave., Bldg 998, Patrick AFB, FL 32925. We are here for you! Please feel free to submit any request and questions that you may have to our Organizational Workflow Group Mailbox @ 45FSSDPH@us.af.mil. Testing is available by appointment only. To schedule, please contact Base Training at 321-494-3440/2072. Note: CDC testing is scheduled by the Unit and Additional Duty Training Managers. Testing days are set for Wednesdays at 7:30 am. DLPT: Defense Language Proficiency Test: Serves to evaluate the ability to understand written and/or spoken material presented in a foreign language format. DLAB: Defense Language Aptitude Battery Evaluates potential ability to complete formal foreign language training. It is used to screen and select foreign language trainees. AFCT: Armed Forces Classification Test: Evaluates airmen in the same four aptitude areas as the ASVAB (i.e., the MAGE composites). These aptitude areas relate to training success in particular groups of AFSs. Minimum scores are required for entry into certain AFSs that indicate the likelihood of training success in the AFS (this test is for those that have already taken the ASVAB and have entered the US military). AFOQT: Air Force Officer Qualifying Test: Used to help select candidates for officer commissioning programs and to classify commissioned officers into utilization specialties such as pilot, combat system operator (CSO), air battle manager (ABM) or technical. EDPT: Electronic Data Processing Test: Evaluates the basic ability to complete formal courses for programming electronic data processing equipment. It is used to screen and select airmen for career fields requiring this ability. EDPT measures verbal ability, symbolic reasoning and arithmetic reasoning. OPI: Oral Proficiency Interview Test: A standardized, global assessment of functional speaking ability. This form of examination is a conversation between the tester and test-taker, the test measures how well a person speaks a language by assessing their performance of a range of language tasks against specified criteria. WAPS: Weighted Airman Promotion System: This form of testing is scheduled per Air Force guidance. Any questions concerning this form of testing should be directed to the Unit WAPS Monitor or Test Examiner at 321-494-3443/2072 DSN:854. 1. An official transcript that includes your degree conferred date, degree level and degree title. An official transcript must be mailed directly to the education office from your college or hand-delivered to the education office in the original sealed envelope. Your college can mail the official transcript tot he following address: 45 FSS/FSDE, 1020 Central Ave., Patrick AFB, FL 32925. 2. Notification of degree completion on official school letterhead from your college registrar's office stating your full name, SSN, degree level and degree. College Level Examination Programs (CLEP) and DANTES Subject Standardized Test (DSST): Shorten your college path by participating in CLEP and DSST exams. These two worthwhile testing programs provide test-takers with the opportunity to earn credits toward Community College of the Air Force or undergraduate degree programs that accept them. CLEP/DSST Test Center: The CLEP/DSST test center is managed by Columbia College. To register to take one of these types of examinations, please utilize the How to Register for CLEP or DSST Examination Instructions. Fri: 8:30 am - 5 pm. First class is tuition free for military family members and spouses. Spouses also receive a 20% tuition discount on all in-seat courses taken thereafter. NOTE: * programs offered online only. Mon - Thu: 8:30 am - 6 pm, Fri: 8:30 am - 3 pm. NOTE: * programs currently offered online only. Classes offered through Hybrid and Online modalities.